Providing you the best range of rotary air lock valves and air lock valves with effective & timely delivery. 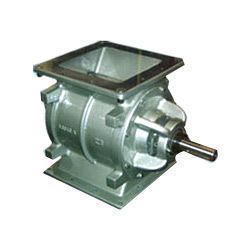 ESSAR Manufactures precision rotary air lock valve to the need of various industries. 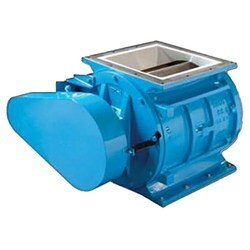 Rotary air lock feeds uniform discharge of material and there is a dosing valve also Rotary air lock valves also seals the air by preventions from Inside to out side and out side to inside. Rotary air lock are versalise and know for smooth operation occupies less space. The prime function of a rotary valve is to regulate the flow from one chamber to another while maintaining a good airlock condition. The product is mainly in dry powder or granular from. In the dust filtration field good airlocks are essential on cyclone and bag filter applications in order that the manufacturer's quoted high dust collection efficiencies can be maintained. Airlocks are also important in the pneumatic conveying industry. Where product is regulated in to a high pressure conveying line while minimising air leakage. Our range of Rotary Air Lock Valves is available in numerous sizes, and is fabricated using mild steel and cast iron. We offer this exceptional product line at industry leading prices, and deliver the client's consignment on time. we are the leading manufacturer for air lock valve in Hyderabad. Looking for Air Lock Valves ?